After several weeks and months of deliberating I finally made a pond in the garden! That looks really good - I would never have guessed it's new. The ferns, grasses and heuchera are nice planting combos too. Meant to ask....Are you having fish or wildlife? Lovely! Your garden looks absolutely beautiful, Sticki - I love the trees! oh, thank you!!!! yes lots of water here too scottish and still it seems i wanted more!! no fish ~ i think the cat might be too tempted!! the trees beyond the fence are not mine, the one in the corner is a copper beech but you cant really see its colour in this picture ~ maybe i should take another when it starts to change colour. thanks surreylad, i had to hide the plastic with the stones, its not perfect but i think its ok for a starting point?? I know some people don't like having large trees either in the garden, or close by, but I just love them and put up with the disadvantages. Well done...and if those trees shelter the pond - even better! Mine is in full sun and, so, will take around five years to settle. No harm in putting some fish in later, though...once the balance is established? Fabulous, it looks like it's always been there, very nice indeed. Ps, I love the grass in the pond, what's its name please ? That´s great Sticki! :)) I like it very much. Did you do it on your own, or was it done by specialists? You are very kind all of you! Melchi I think I might be sweeping up a few sacks full of leaves very soon! Thanks Cinderella and Karen - do you think the fish would be safe from my cat? Thanks Val, do you mean the little spiky grass? I will go and look at the label for you, it's dark outside now! Katarina that's much too kind, specialist?? No, I dug it all myself! Then congratulation. Very nice work. I do many things in the garden myself, too.Uf. There's lots about it that could be improved, it's not a very close up photo! :-)) Garden looks lovely too!!!!! I have cats and fish in my pond...... noooo not cats in the pond ! ! Hee hee had too much wine ! anyway as I was saying I put a mesh over the the water and that keeps the cats out. Val its 'Scirpus cernuus' ~ cotton bud rush its about 4 inches tall? ...despite their (fish) attention span, they do learn and don't get caught that easily....and they eat all new shoots!! thanks karen, maybe i will think about it next spring? i do like fish, i was admiring them in the GC!! I have fish and a Milliepuss!! Oh how exciting Sticki....a pond! Wishing you many happy moments beside it! thanks lulu ~ not too sure minty is as well behaved as millie!!! the bit at the front of the pond has a largish flat stone for me to sit on and watch the pond life!!! I see it - well found and placed! I love mossy rocks - lots here at the top of the garden edging the bridlepath. I see oysters coming your way and some black snails!! I think we are going to have to come visit and bring pond presents! lucky find i think neellan! And nothing is beautiful from every point of view. You have nice garden and I am just curious, why I do not get photos from there, although I several times put you among my favs. Ok katarina I will live with it!! Not many photos of my garden? Probably because I find other gardens more interesting! Other gardens make better photos! I will try to do a blog of this one sometime. How deep is it Stickie? Looks great I've been "pondering" making a pond I have had fish in the past in a previous life and they were very rewarding, But I too am reluctant to have fish again as there are a number of cats in in my neighbourhood so it would not be practical. I may try for wildlife though as a way of keeping down the ever increasing slug population! maybe a few frogs or toads? yours is very inspiring. Thank you for sharing it with us. It looks great Sticki, just what I would like in my garden....you're obviously one fit gal to dig all that yourself! Did you use the soft liner or a preformed shape? I feel all inspired ...in spite of the fact that it is after midnight & I have just climbed into bed after a busy 8 hour duty on the ward. We have an area in our back garden that is just begging to have a pond put in. We actually get a lovely pond there every time it rains heavily & we get to enjoy it for about 3 days, as it gradually decreases in size. Your pond looks great. it looks lovely. have you done, or will you do, a blog on the work? I find that a torch at night makes great newt viewing! You can be proud of you. its about 18" deep lulu ~ they told me to dig it that deep to stop it freezing over. you are very welcome janette, im very much hoping frogs and toads will come to the garden now ~ there are far too many slugs here!!! janey, thank you, its the soft pvc sheeting, guaranteed 20 years [so they said] cheaper than the preformed but mainly because i didnt think i could dig accurately enough to get it right for the preformed one. thanks dwyllis ~ this one took me the best part of 2 days so im sure you could make one, yours might be quicker if it fills up naturally?!! good idea lulu, its only 2 yards from the back door! maybe a chance next spring? thanks stevie!! quite good when you can angle the camera to hide some of the mistakes! yes, sorry, there are nice quiet woods behind but a [too] busy road at the front of the house! That looks wonderful - as others have commented, no one would realise it was "new". You're too modest about your achievement! (when one's worked on something oneself, all the "errors" are glaring, aren't they - but unless you point them out no-one else even sees them; I do patchwork quilts, and I can see every imperfect stitch - of which there are many!) Your garden looks beautiful, when you have some leisure do keep that promise to let us have a blog and some photos. thank you monjardin, im fascinated by the quilts ~ do you have any pictures ~ i would love to make one [just a very plain one ~ no patterns] but out of Harris tweed! one day i may do that blog ~ maybe next week, this weekend will be a bit busy! thank you, i hope the frogs come too oliveoil, this garden provides a feast of slugs all ready for them! A Harris Tweed quilt would make a wonderful throw, Sticki! thanks melchi, i have bid a few times on ebay to try to get some scraps but lost each time!!! havent given up yet. I'm sure you'll get there, Sticki! They are quite expensive, aren't they? the bids on ebay start really cheaply so i think i have a chance but then they zoom right up!!! i keep hoping, may contact the seller direct, do you think that would work? It might. I'm not all that experienced with ebay, though I have bought a couple of things. If it's always the same seller, though, you may be in with a chance. With some things, I know you have the opportunity to buy at a fixed price. The trouble is, if the sellers always gets a good price through auction, that's probably the way they prefer to do business. i know olive, im beginning to think that!! it is always the same seller so thats why i think i may try to do that, i can name what seems to me a reasonable price ~ they can always say no!! but i agree if ebay works for them why not use it? i dont begrudge the harris tweed weavers having some money!! I really hate it when you're the winning bid (sometimes the only bid) right up to thirty seconds before an auction ends, and then someone nips in and outbids you and you don't have time to counterbid. There was one instance when I got it, though: I'd bid high because I really wanted the item, I was watching the screen for the last couple of minutes, fingers crossed: someone came in to raise the bid and my auto-bid came right back and didn't leave *them* time to come back. I usually go for "buy it now" because of this, and because bidding can be a bit addictive. I was looking though my bank statement once, and noticed a lot of PayPal transactions: I added them up and found I'd spent slightly over three thousand pounds - in one month! - on eBay. That sobered me and no mistake - a litle bit here and there is nothing until you add it all up. Do you have a local Freecycle group? It's amazing what you can get for nothing if you ask! You know what, Sticki? Just tell yourself the cheapest way to get the tweed is to go to Harris for it. Then you can have another dream holiday, we can have another blog and everyone will be happy! And you'll have the tweed, as well! 3,000 fran eeek! i dont win the bids cos i set a figure in my mind and i wont go over it!!! i think there is freecycle but dont think they have harris tweed. melchi that is the very best suggestion ~ if only i could go now!!!! the only thing is i dont think many of them sell it that way, the places we went to didnt have any scraps!! always worth another try though!! Yes - you can have fun searching! Talking of scraps - did you ever see the opening credits for Hamish MacBeth? They had some scraps of tartan fabric, and it really used to annoy me that they were so creased! I couldn't understand why! i used to like hamish macbeth! but i dont remember the tartan, maybe it was an ancient one they had discovered!? There was a selection of tartan scraps that were sort of "sprinkled" around the titles. Most aggravating! Lol - I never usually care too much about the ironing! i agree, i hate ironing!! i shall have to youtube it to remember, no doubt some idea behind it but lost on me im afraid!!! There are some interesting threads on GOY, aren't there?!! you never quite know what will turn up do you!? some of them are silver and gold threads!!!! 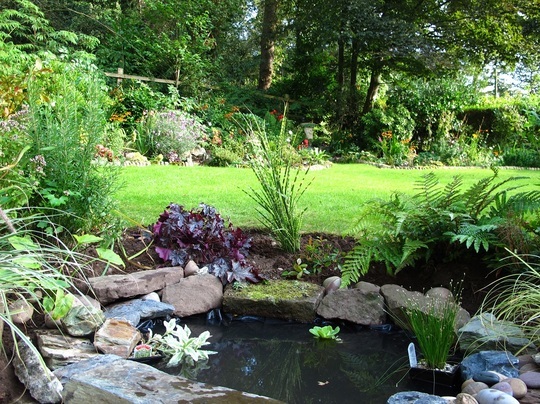 And yet another lovely pond, spoiled for choice now........well done Sticki a perfect setting for it. Thanks DD, I'm glad I made it, it's really nice to have water in the garden. unfortunately the stone around the top of the pond; in the area nearest to the camera doesnt show on the photo ~ but i put in a large flat stone so i can sit next to the pond and watch out for hopeful wildlife? thanks sanbaz, i keep changing little bits but i quite like the fact that i can move the stone and plant more things round it! a bit more lawn could be going !!! What is new in the pond? A few changes of planting at the back Kat, got a few more bits to sort out then I will do a new photo. I put an acer in at the back and there will be a couple of little cyclamen too. An Acer will be lovely at the back. Sadly no katarina, couldn't find one! Thanks lulu I love em! Westonbirt looks amazing from the road side when I drive past! ooooh i would like to be there! Me too, it's just so expensive. I may go with Prudence if it's nice weather..
i wish it wasnt so expensive lulu, i/we could go more often then! and you as a resident of the same county ought to have a reduction in price. thanks karen! i think we got chatting!!! i have to take the leaves out of it now! What a great job you've done Sticki. It looks so mature already. You are very kind homebird, it really wasn't difficult at all, I might put another photo of it onion another couple of days, I changed the planting at the back a little, it has also now got a very beautiful decoration! Thank you ghost garden there are a few fallen leaves in it now that I need to clean up! Always take leaves out of little ponds!! Otherwise they can get stinky! Oh ok, thanks lulu, I'm in London tonight but hoping to do some cleaning up on Tuesday when I'm back. I did put a coup,e of little snails in. Oh that's a nice snail! Your garden looks lovely and the pond has settled in well. Hope you do get some frogs and toads. Millie Puss after being locked in a feed room for nearly 24 hours! Oh no! Poor miliepuss! But at least it would have been warm and dry?! You have such a beautiful garden! Love the pond! Your garden looks huge, also. too kind delonix! it really isnt a big garden. maybe 16 yards wide and 9 yards front to back??? Maybe because its taken on the diagonal angle? Must remember that when I need a photo for the estate agent!